I hope you guys are having a wonderful start to the school year. Sydney and Jeremiah are doing well. I thought I would share with you some wonderful news, Sydney was baptized last weekend! She had to go through a baptism interview at church a month ago and she passed with flying colors. She was so excited. Below is the video (its only a minute long). 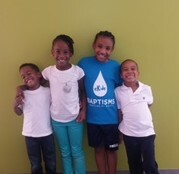 I also attached a picture of the get along gang prior to the baptism. Thanks and you guys have a great weekend! I want everyone involved in the young man’s success to know that we are thankful for his strong foundation. Folks always ask how he could be a senior and be so much younger than his classmates, and we reply “Lake Norman Day School”. We are well, and he has about 15 great offer for college! We thank God and those involved from the beginning!